Several new wildland fires were reported in Alaska on Saturday as a result of widespread lightning that stretched across the middle of the state from Southwest Alaska to the Canadian border. The state received approximately 8,000 lightning strikes and 18 new lightning-caused fires were reported, according to the Alaska Interagency Coordination Center. Another round of lightning is forecast late in the afternoon today and state and federal fire managers are expecting more new fires, in addition to possible holdover fires from Saturday’s lightning. While precipitation has fallen in some parts of the state, other parts of the state, particularly the central and eastern Interior, remain very dry with high fire danger. 2016 Washington Creek Fire (Fairbanks Area) – Reported at 7:15 p.m. north of Haystack Mountain, approximately 25 miles north of Fairbanks. It was reported at 20 acres, burning in black spruce with extreme fire behavior that included 50-foot flame lengths and spotting out 100 yards. An air retardant tanker and two water-scooping aircraft were deployed for retardant and water drops. Seven smokejumpers from the BLM Alaska Fire Service and a helitack load of five technicians from Alaska Division of Forestry responded to initial attack the fire. Two crews were shuttled into the fire by helicopter to assist with suppression and cutting saw line. The fire was knocked down at 40 acres and containment continues with the addition of another Type 2 initial attack crew from the U.S. Forest Service. There were 45 personnel working on the fire as of late Saturday night and that number will increase when the U.S. Forest Service crew arrives today. Billy Creek Fire (Tok Area) – Reported by a local resident at 4 p.m. approximately 11 miles north of Dot Lake and north of the Tanana River. An engine and helitack from Tok responded but the engine was not able to reach the fire from the road. Helitack reported the fire to be 2 acres in a full protection area, burning in brush and hardwoods and backing down a slope. The helicopter was unable to locate a suitable landing zone and four BLM Alaska Fire Service smokejumpers were dropped on the fire to cut out a landing zone for the helicopter. Another helicopter was diverted from the Tetlin River Fire south of Tok to assist with dropping water on the fire. Bucket work by the two helicopters knocked the fire down and the helicopter diverted from the Tetlin River Fire was released back to that fire. Smokejumpers completed the helispot and were demobilized from the fire. The Nikolai Type 2 Crew will be reassigned from the Tetlin River Fire on Sunday to assist the helitack load with mop up. The smoke column from the 2016 Washington Creek Fire north of Fairbanks at approximately 9 p.m.
Caribou Creek Fire (Fairbanks Area) – Reported at 4:10 p.m. about 30 miles northeast of Fairbanks and 10 miles north of Chena Hot Springs Road. Helitack from Fairbanks responded and found a 5-acre fire spreading to black spruce and hardwoods with single tree torching and 3- to 6-foot flame lengths. No immediate resources were threatened by the fire but the fire was in a full protection area and initial attack resources were ordered. An air retardant tanker and helicopter dropped retardant and water on the fire to prevent it from spreading. A load of eight smokejumpers from the BLM Alaska Fire Service and a helitack load of five Division of Forestry technicians remained on the fire overnight to continue suppression efforts and mop up. Munson Creek Fire (Fairbanks Area) – Reported by air attack personnel about 50 miles east of Fairbanks and 7 miles south of Chena Hot Springs Resort. The fire was spotted near Munson Creek and was one-tenth of an acre, burning in a mixture of white and black spruce. The fire was in a limited protection area with no immediate threat to resources. No action was taken on the fire and DOF will be monitoring it. Michigan Creek Fire (Delta Area) – Three separate fires were reported in the area of Michigan Creek approximately 35 miles northeast of Delta Junction at approximately 2:30 p.m. A caller reported seeing smoke after observing several lightning strikes in the area. Air attack, a retardant tanker and a helitack load from Delta Junction responded and found a 20-acre fire that plotted in a limited protection area. All air resources were canceled per the landowner’s request and the fire was placed in monitor status. While responding to the fire, air attack personnel observed two more lightning-caused fires in the same area that also were in limited protection. Both fires consisted of a lightning strike of a single tree. The air retardant tanker dumped a splash of retardant on each fire and they were placed in monitor status. Little Delta Fire (Fairbanks Area) – The Division of Forestry in Fairbanks received a smoke report approximately 40 miles west of Delta Junction just before 10 a.m. Saturday. A helitack load from Fairbanks responded and found an 8-acre fire burning in tundra west of the Delta River in a limited protection area between two old fire scars. No resources were threatened and no action was taken. The fire was placed in monitor status. Bergman Creek Fire (Tanana Zone) – Two fires were spotted by a local resident Saturday night burning about a quarter of a mile from each other and about 5 miles west of Alatna. An airplane flying BLM Alaska Fire Service smokejumpers to another fire reported this fire as 80 percent active with a west wind. Nothing was immediately threatened. Four water-scooping Fire Boss airplanes that were staged in Bettles were working this fire today. 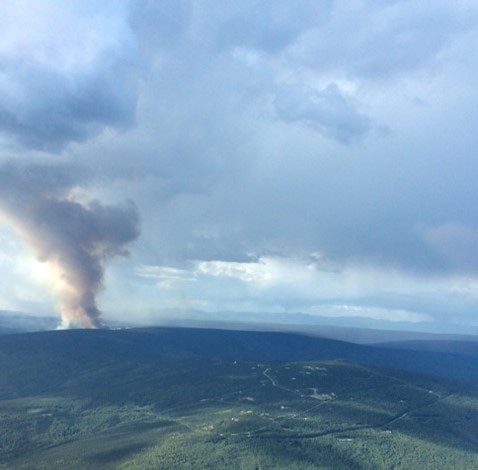 Iniakuk Lake Fire (Tanana Zone) – Reported by a local resident via Brooks Range Aviation in Bettles. A ridge separated the fire from a cluster of structures about a mile away, including the Iniakuk Lake lodge, which sits on the east side of the lake. The fire was reported to be about 43 miles west of Bettles. Eight smokejumpers were deployed to the fire, along with four water-scooping aircraft. The smokejumpers were able to cut a line around the perimeter to discourage further spread. Suppression operations will continue ito Sunday and the water scoopers will be close at hand for support.